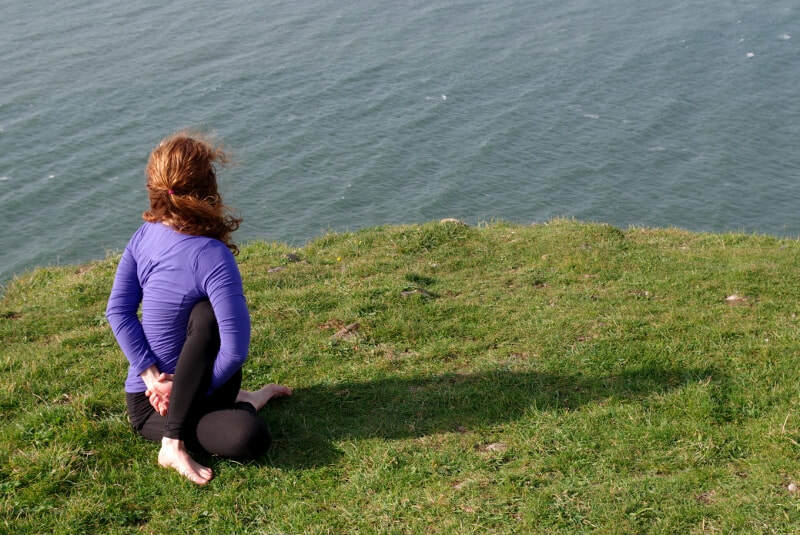 Yoga Classes in Swansea, Carmarthenshire and Pembrokeshire - Blue Sky Yoga, Swansea, Carmarthenshire and Pembrokeshire. A somatic approach to posture and movement, emphasising interoception to relax the body/mind and bring a greater sense of wellbeing. Suitable for complete beginners, those with health conditions and particularly helpful if you are suffering with depression or anxiety. Encompassing all aspects of hatha yoga, after our movement practice, we explore different forms of meditative mantra to calm the busy mind. The session ends with a 15 minute lying meditation/ relaxation using aspects of yoga nidra. ​Please bring a yoga mat, a bottle of water and a blanket for relaxation. *Please note: I am holding two extra classes on Tuesday 9th and 16th April - drop-in only. ​This weekly hatha yoga class is suitable for all abilities, including complete beginners. ​We practice a variety of yoga postures and sequences, to keep the body moving well and the mind relaxed. The emphasis is on finding freedom in movement, through awareness of tension, effort and relaxation. A typical class includes: time to become centred, focusing on the breath; gentle movements to release tension; yoga postures designed to build strength, balance and flexibility; 10 minutes deep relaxation. Please bring a yoga mat, a blanket and a bottle of water. Louise's classes give me a deep sense of connection to my own unique body. I feel like I can breathe easier and slow down enough to heal and restore. Suitable for all abilities, including beginners. We practice a variety of simple yoga postures and sequences. Each practice is progressive and somatically informed; your own body will tell you what it is happy to do. The emphasis is on finding freedom in movement, through awareness of tension, effort and relaxation. A typical class includes: time to become centred, focusing on the breath; gentle movements to release tension and increase interoception; yoga postures to explore strength, balance and flexibility; 15 minutes deep relaxation. Please bring a yoga mat, a blanket and a bottle of water. "I struggle with quite severe fibromyalgia, ME, Crohns disease, osteoarthritis and anxiety, so it is amazing to feel good, despite the pain. A normal night's sleep for me is 9.30 -2am, maybe 3 if I'm lucky and I thought I might struggle with that last night after yoga nidra, but I fell asleep at 7.30 and woke at 4am. Brilliant. I even slept through my alarm to take my meds! So glad I bought your CD as I now have you on tap. I can't thank you enough, haven't felt so good in ages. I'm just at the beginning of meditation and yoga that I can manage physically and yesterday has reaffirmed my hope that it can help change things for me. I just mentally and physically feel the best I have in years, can't wait to come to you again."